Made famous by the Jewish delis of New York, learn how to make smoked brisket pastrami. This post is sponsored by Lone Mountain Wagyu. It’s the main ingredient in Reuben sandwiches, but delicious on it’s own or sandwiched between rye bread. 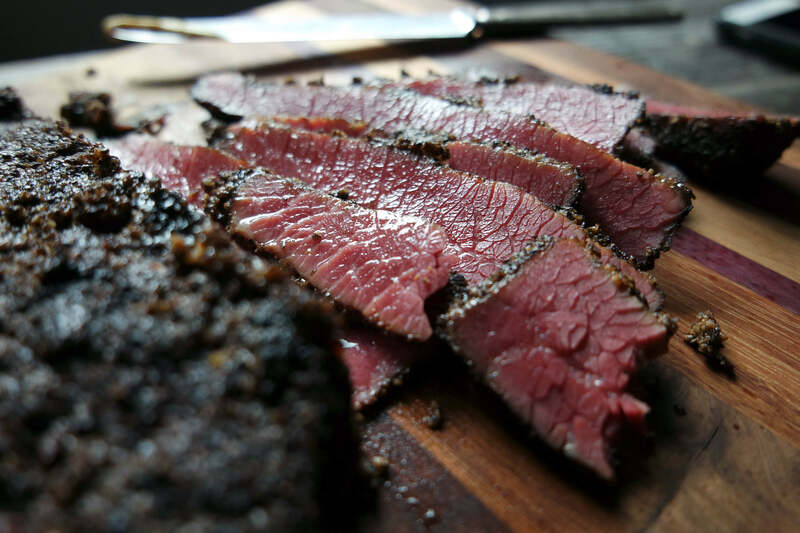 Pastrami is what happens when you take corned beef to the next level – by smoking it! Commercial production sees the pastrami made tender by steaming in large industrial units, but this home-friendly version uses your oven to recreate the delicious dish. For this recipe I used Lone Mountain 100% fullblood wagyu brisket, which gave an even richer and more luxurious finish. Trim the brisket flat of any remaining fat. Combine water, sugar and salt in a small pan and place over low heat. Stir until sugar and salt have dissolved, then allow mix to cool. Once cooled, add in curing salt and spices. Lay brisket in a large container and cover with cure mix. The meat must be completely immersed. Cover and place in fridge for 5-6 days. Remove brisket flat from brine/cure. It will be a pale grey in color, this is normal. Discard the cure and replace with plain water. Allow brisket to soak 1-2 hours. Combine all ingredients for the rub in a bowl. Remove brisket from the water and use paper towel to pat dry. Season the brisket well with the rub, pushing and massaging it into the surface. The rub should be very concentrated and “crusty”. Place the rubbed brisket back into the fridge, uncovered, overnight. Fire up a smoked to 250f. Place the brisket into the smoker, and smoke for 4-6 hours until an internal temperature of 165f is reached. Heat an oven to 250f. Remove brisket from smoker, and tightly wrap in 3-4 layers of cling wrap, then 2 layers of foil. Place brisket into oven to continue cooking until it reaches 205f internal temperature, which may take another 4-6 hours. Slice and serve warm pastrami – it’s recommended you serve with pickles, mustard and rye bread.